Mecum Auctions will sell off a relatively rare 1993 Chevrolet Silverado Indianapolis 500 Pace Truck Edition at its upcoming Indy 2019 auction in May. Chevy decided to build a 1,235 unit production run of trucks in celebration of the 77th running of the Indy 500 in 1993. The Silverado didn’t actually serve as the pace truck that year (it was actually a Camaro Z/28) but the truck was the ‘Official Truck of the 77th Running of the Indianapolis 500’, hence the creation of the limited-edition Silverado. This particular example isn’t mint condition by any means, but for that reason, it may sell for a bargain when it crosses the auction block ahead of this year’s running of the 500-mile race. Some rust in the engine bay and minor exterior and interior cosmetic blemishes indicate this truck has been well-used, however it still comes with the original 350 V8 engine, original automatic transmission and the original wheels. Other notable options on this truck include a roof-mounted visor, a tonneau cover, a locking tailgate and air conditioning. It’s not clear how many miles it has, although you can always contact Mecum for more info if you’re interested in this radically retro pickup. 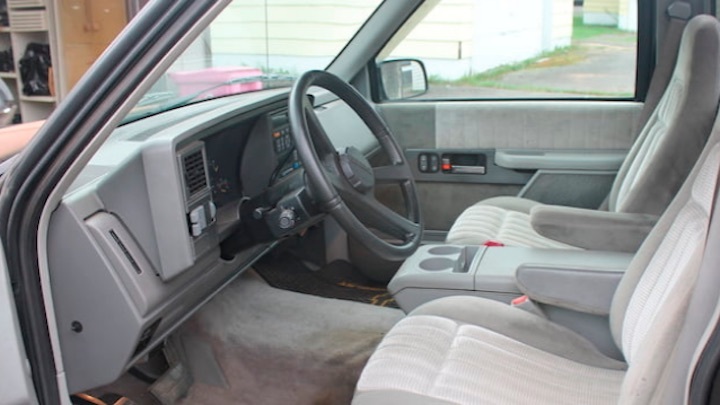 The 1993 Chevrolet Silverado Pace Truck is being offered without reserve and will be sold off on May Tuesday, May 14th. There you are, a regular cab short box. The Brickyard 400 had a similar pace truck at that time, too. One of best looking factory trucks. Just for the record the FIRST Brickyard 400 was in 1994. Not 1993. It’s funny to hear these trucks called “retro”. When GM launched the GMT-400 platform in the fall of ’87 it was like Armageddon for Chevy truck lovers! Most of us had only known the “square bodies” for our entire lives and this truck was so futuristic looking that it took a little while to warm to. But it didn’t take long to prove it was one of the best platforms they ever built! Still looks modern and new to me, but I remember Nixon. Loved the GMT 400 trucks. Still own a 93 3500 long box diesel I bought new (awaiting restoration). I like these little auction house articles too…kinda neat to see what things are crossing the block these days.